The MACD crossed below the signal line 3 period(s) ago. Since the MACD crossed the MACD moving average, US Dollar / Japanese Yen’s price has decreased 1.20%, and has been fluctuating from a high of 100.366 to a low of 97.630. The Stochastic Oscillator is currently below 20. This is an indication of the security being in an “oversold” condition. The ADX is currently below both Plus and Minus Directional indicators and should not initiate any trades right now. The Directional Movement Indicators (DMI) currently is not indicating a specific price direction and should not initiate any trades right now. There were no SAR signals generated today. The last SAR signal was a Sell 2 period(s) ago. The most recently confirmed down trendline for US Dollar / Japanese Yen has an ending point currently at 100.29. Expect prices to have some difficulty rising above this trendline. A break above this trendline would be a bullish sign. The most recently confirmed up trendline for US Dollar / Japanese Yen has an ending point currently at 94.57. Expect prices to have some difficulty falling below this trendline. A break below this trendline would be a bearish sign. US Dollar / Japanese Yen closed above the lower Bollinger Band by 9.2%. Bollinger Bands are 29.36% narrower than normal. The current width of the Bollinger Bands (alone) does not suggest anything conclusive about the future volatility or movement of prices. 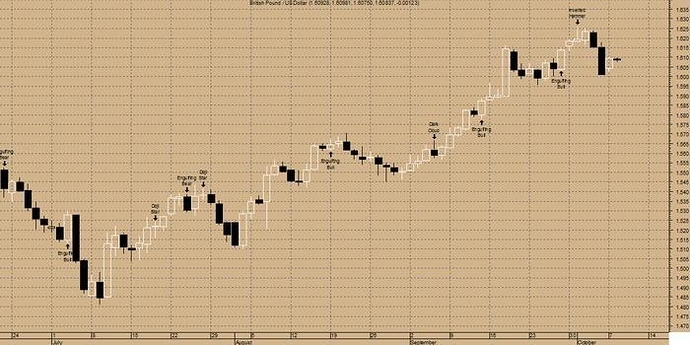 A doji star has formed where a doji gaps above or below the previous candle. This often signals a reversal with confirmation occurring on the next bar.Three white candles has formed during the last three bars. Although these candles were not big enough to create three white soldiers, the steady upward pattern is bullish. 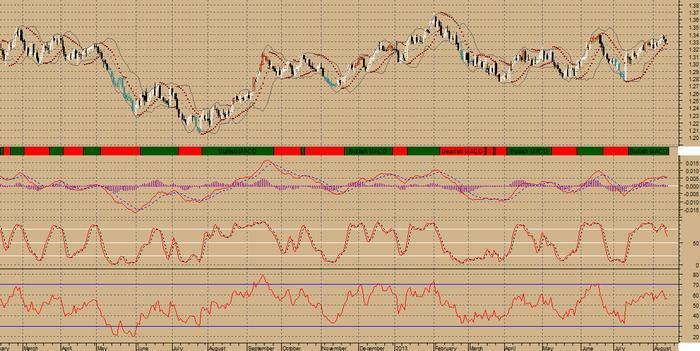 MACD is BULLISH as the MACD is above the signal line as the MACD crossed above the signal line 2 period(s) ago. Since the MACD crossed the MACD moving average, British Pound / US Dollar’s price has increased 0.46%, and has been fluctuating from a high of 1.538 to a low of 1.510. 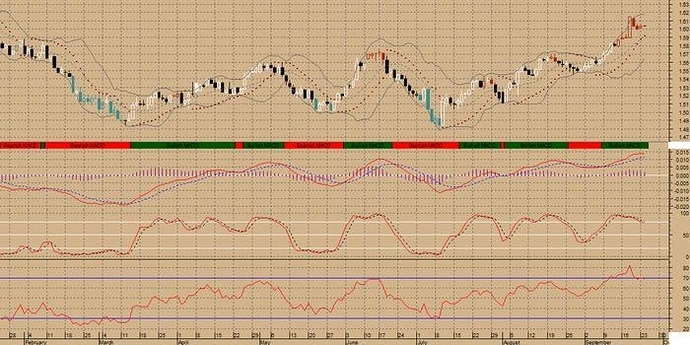 Stochastic signal was a Sell 5 Period(s) Ago. The ADX is currently below both Plus and Minus Directional indicators and the Directional Movement Indicators (DMI) currently is not indicating a specific price direction, should not initiate any trades right now. The last SAR signal was a Sell 4 period(s) ago. British Pound / US Dollar broke above the down trendline at 1.54 today. This is a bullish sign. This down trendline, currently with an ending point at 1.53, now provide downside support. The most recently confirmed up trendline for British Pound / US Dollar has an ending point currently at 1.51. Expect prices to have some difficulty falling below this trendline. A break below this trendline (particularly on heavy volume) would be a bearish sign. British Pound / US Dollar closed below the upper Bollinger Band by 23.9%. Bollinger Bands are 21.40% narrower than normal. The current width of the Bollinger Bands (alone) does not suggest anything conclusive about the future volatility or movement of prices. 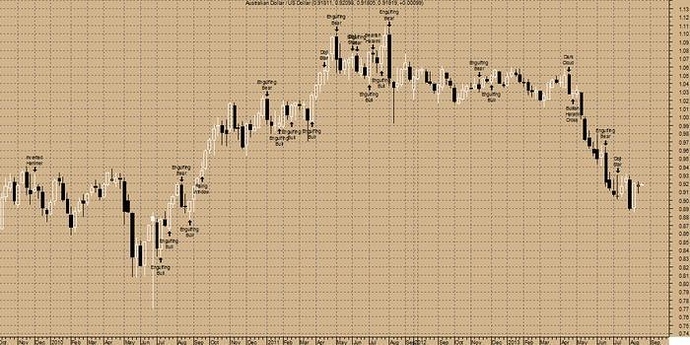 The previous 50 candlestick bars, there are 22 white candles versus 28 black candles with a net of 6 black candles. A long upper shadow has formed. This is typically a bearish signal (particularly when it occurs near a high price level, at resistance level, or when the security is overbought).MACD is BULLISH as the MACD is above the signal line. The MACD crossed above the signal line 4 period(s) ago. Since the MACD crossed the MACD moving average, British Pound / US Dollar’s price has increased 1.47%, and has been fluctuating from a high of 1.557 to a low of 1.503. Stochastic signal was a Sell 7 Period(s) Ago. The Directional Movement Indicators (DMI) currently is not indicating a specific price direction. Should not initiate any trades right now. SAR signal was a Sell 6 period(s) ago. British Pound / US Dollar closed below the upper Bollinger Band by 28.0%. Bollinger Bands are 31.56% narrower than normal. The current width of the Bollinger Bands (alone) does not suggest anything conclusive about the future volatility or movement of prices. The MACD crossed above the signal line 22 period(s) ago. Since the MACD crossed the MACD moving average, Euro Dollar / US Dollar’s price has increased 1.81%, and has been fluctuating from a high of 1.340 to a low of 1.300. Stochastic signal was a Buy 24 Period(s) Ago. 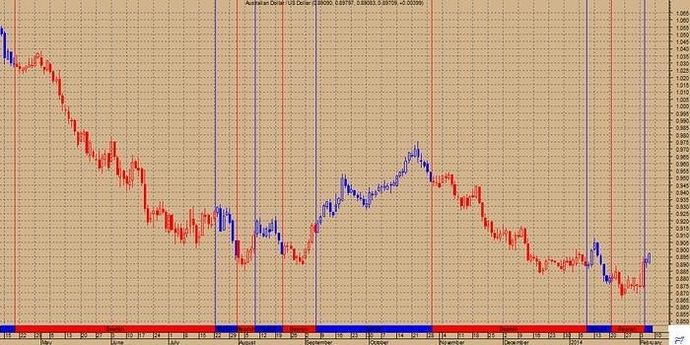 The last SAR and Directional Movement Indicators (DMI) signal was a BUY 24 period(s) ago. The current market condition for Euro Dollar / US Dollar is Very Bullish. The most recently confirmed up trendline for Euro Dollar / US Dollar has an ending point currently at 1.28. Expect prices to have some difficulty falling below this trendline. A break below this trendline would be a bearish sign. The previous 10 candlestick bars, there are 5 white candles versus 4 black candles with a net of 1 white candles. A spinning top has formed which is a candle with a small real body. Spinning tops identify a session in which there is little price action as defined by the difference between the open and the close. 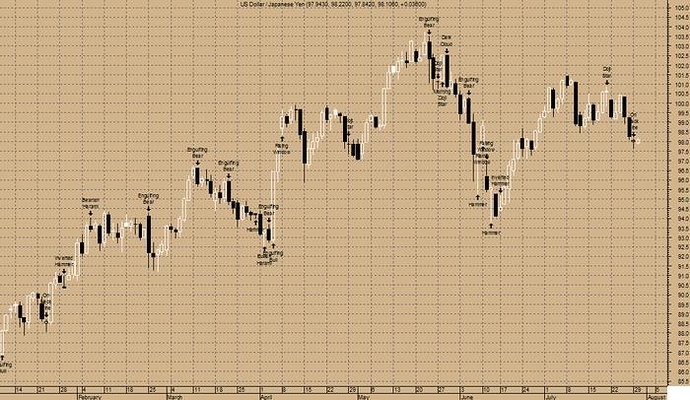 During a rally or near new highs, a spinning top can be a sign that prices are losing momentum and the bulls may be in trouble.Three white candles has formed during the last three bars. Although these candles were not big enough to create three white soldiers, the steady upward pattern is bullish. The MACD crossed below the signal line 17 period(s) ago. Since the MACD crossed the MACD moving average, Australian Dollar / US Dollar’s price has decreased 10.57%, and has been fluctuating from a high of 1.038 to a low of 0.885. RSI signal was a Buy 2 period(s) ago. 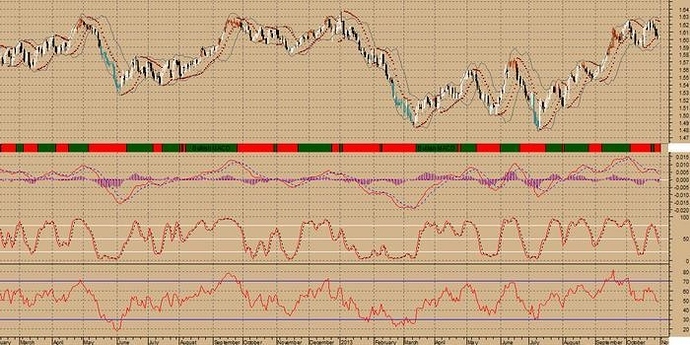 The RSI has set a new 14-period high while the price of Australian Dollar / US Dollar has not. This is a BULLISH DIVERGENCE. 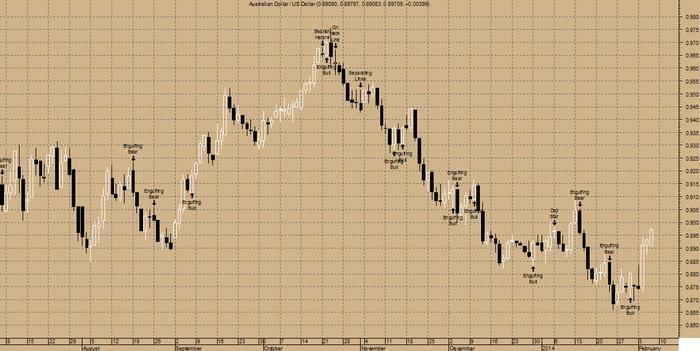 The current market condition for Australian Dollar / US Dollar is Very Bearish. Australian Dollar / US Dollar broke below the up trendline at 0.97,14 week(s) ago. This is a bearish sign. This up trendline, currently with an ending point at 1.01, may now provide upside resistance. Prices have declined 5.84% since the breakout. Australian Dollar / US Dollar closed above the lower Bollinger Band by 31.9%. Bollinger Bands are 63.81% wider than normal. [B]Overall, the bias in prices is: Downwards. 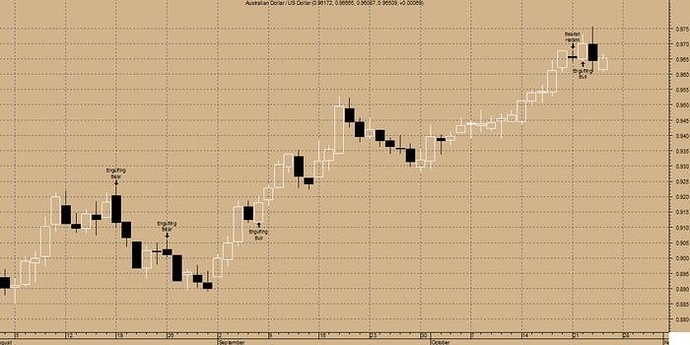 A doji star has formed where a doji gaps above or below the previous candle. This often signals a reversal with confirmation occurring on the next bar. MACD is BULLISH as the MACD is above the signal line. The MACD crossed above the signal line 12 period(s) ago. Since the MACD crossed the MACD moving average, British Pound / US Dollar’s price has increased 2.38%, and has been fluctuating from a high of 1.567 to a low of 1.510. The Stochastic Oscillator is currently above 80. This is an indication of an “overbought” condition. Stochastic was a Sell 5 Period(s) ago. The current market condition for British Pound / US Dollar is Very Bullish. British Pound / US Dollar broke above the upside resistance level of 1.56, 1 day ago. This is a bullish sign. This previous resistance level of 1.56 now provide downside support. Prices have only risen 0.01% since the breakout. The most recently confirmed downside support level for British Pound / US Dollar is around 1.49. Expect prices to have some difficulty falling below this level. A break below this level (particularly on heavy volume) would be a bearish sign. British Pound / US Dollar closed below the upper Bollinger Band by 12.7%. Bollinger Bands are 16.82% wider than normal. The current width of the Bollinger Bands (alone) does not suggest anything conclusive about the future volatility or movement of prices. [B]Overall, the bias in prices is: Upwards. A spinning top has formed which is a candle with a small real body. Spinning tops identify a session in which there is little price action as defined by the difference between the open and the close. During a rally or near new highs, a spinning top can be a sign that prices are losing momentum and the bulls may be in trouble. The MACD crossed below the signal line 0 period(s) ago. Since the MACD crossed the MACD moving average, British Pound / US Dollar’s price has been unchanged, and has been fluctuating from a high of 1.559 to a low of 1.556. 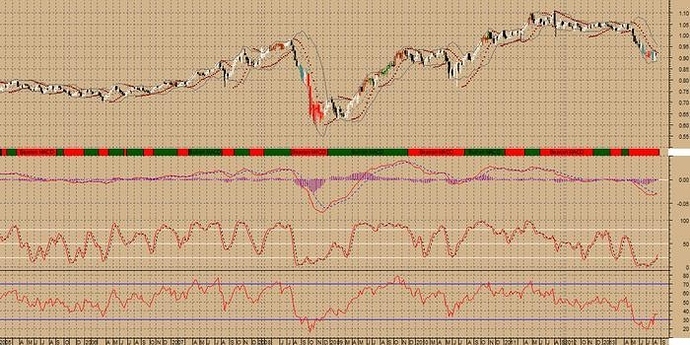 Stochastic signal was a Sell 10 Period(s) Ago. The Directional Movement Indicators (DMI) currently is not indicating any specific price direction and should not initiate any trades right now. SAR signal was a Buy 15 period(s) Ago. British Pound / US Dollar closed below the upper Bollinger Band by 36.9%. Bollinger Bands are 15.53% wider than normal. The current width of the Bollinger Bands (alone) does not suggest anything conclusive about the future volatility or movement of prices. MACD is BULLISH as the MACD is above the signal line. The MACD crossed above the signal line 10 period(s) ago. Since the MACD crossed the MACD moving average, US Dollar / Japanese Yen’s price has increased 2.28%, and has been fluctuating from a high of 99.694 to a low of 96.813. The Stochastic Oscillator is currently above 80. This is an indication of being in an “overbought” condition. No Stochastic Buy or Sell signals generated today. The last signal was a Buy 15 Period(s) Ago. The Directional Movement Indicators (DMI) currently is not indicating a specific price direction. Because this is a trend following system, it should not use to initiate any trades right now. 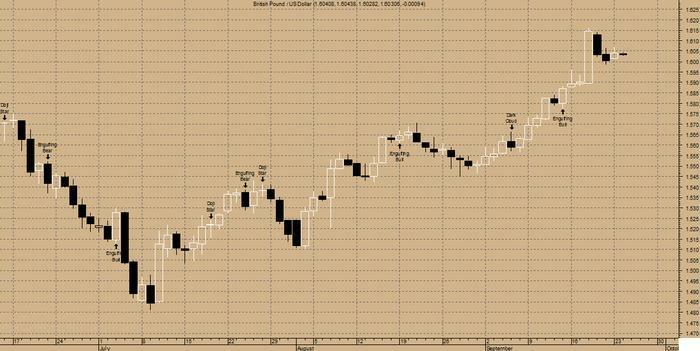 The last Directional Movement Indicators (DMI) signal was a BUY 131 period(s) ago. SAR signal was a Buy 1 period(s) Ago. 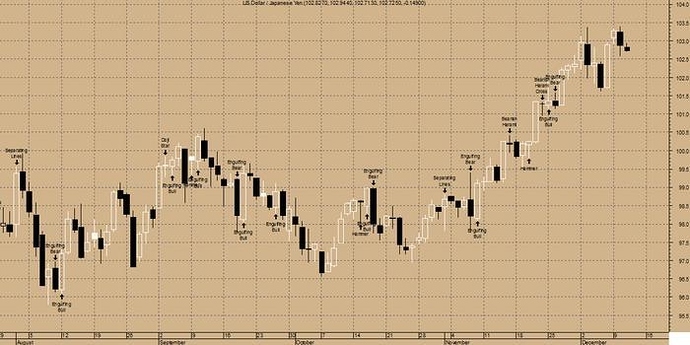 The current market condition for US Dollar / Japanese Yen is Very Bullish. US Dollar / Japanese Yen broke above the down trendline at 99.56, one day ago. This is a bullish sign. This down trendline, with an ending point at 98.18 provide downside support. Prices having only risen 0.04% since the breakout. The most recently confirmed up trendline for US Dollar / Japanese Yen has an ending point currently at 96.71. Expect prices to have some difficulty falling below this trendline. A break below this trendline would be a bearish sign. 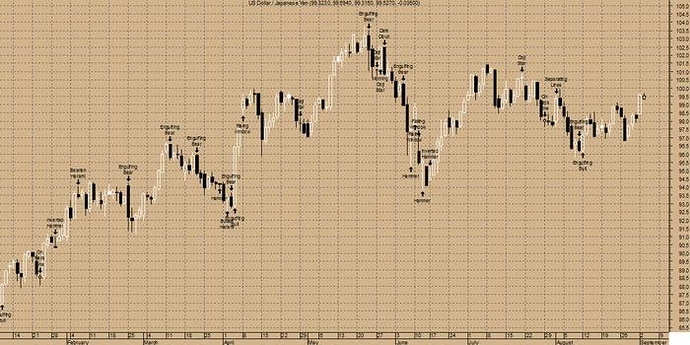 US Dollar / Japanese Yen closed below the upper Bollinger Band by 2.4%. Bollinger Bands are 33.66% narrower than normal. The current width of the Bollinger Bands (alone) does not suggest anything conclusive about the future volatility or movement of prices. A bearish harami has formed where the current small black body is contained within an unusually large white body. 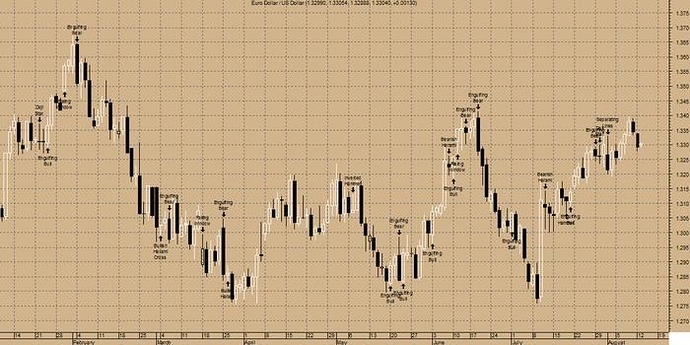 During an uptrend(which is the case with British Pound / US Dollar) this pattern implies an end to the rally as the bulls appear to have exhausted. MACD is BULLISH as the MACD is above the signal line. The MACD crossed above the signal line 1 period(s) ago. Since the MACD crossed the MACD moving average, British Pound / US Dollar’s price has decreased 0.04%, and has been fluctuating from a high of 1.573 to a low of 1.563. The Stochastic Oscillator is currently above 80. This is an indication of being in an “overbought” condition. SAR signal was a Buy 3 period(s) Ago. The current market condition for British Pound / US Dollar is Very Bullish. British Pound / US Dollar broke above the upside resistance level of 1.56, 1 day(s) ago. This is a bullish sign. This previous resistance level of 1.56 now provide downside support. Prices having only risen 0.04% since the breakout. The most recently confirmed downside support level for British Pound / US Dollar is around 1.49. Expect prices to have some difficulty falling below this level. 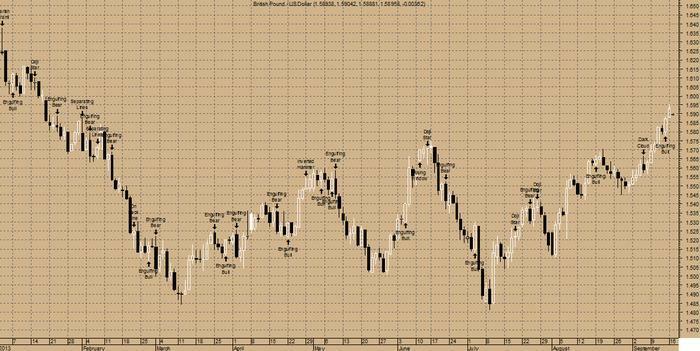 A break below this level (particularly on heavy volume) would be a bearish sign. British Pound / US Dollar closed below the upper Bollinger Band by 7.4%. Bollinger Bands are 56.68% narrower than normal. 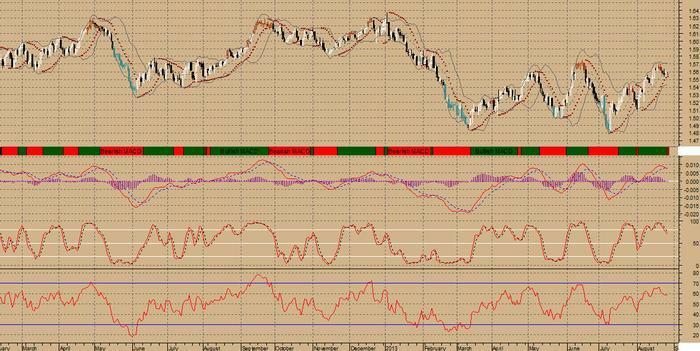 The narrow width of the Bollinger Bands suggests low volatility as compared to British Pound / US Dollar’s normal range. Therefore, the probability of volatility increasing with a sharp price move has increased for the near-term. The Bollinger Bands have been in this narrow range for 6 period(s). The probability of a significant price move increases the longer the Bollinger Bands remain in this narrow range. Three white candles has formed during the last three bars. Although these candles were not big enough to create three white soldiers, the steady upward pattern is bullish. MACD is BULLISH as the MACD is above the signal line. The MACD crossed above the signal line 6 period(s) ago. Since the MACD crossed the MACD moving average, British Pound / US Dollar’s price has increased 1.27%, and has been fluctuating from a high of 1.596 to a low of 1.563. The Stochastic Oscillator is currently above 80. 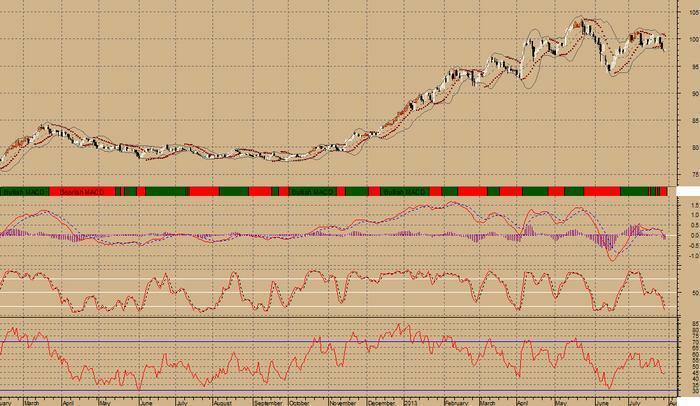 This is an indication of an “overbought” condition and the RSI is above 70. This is where it usually tops. The RSI usually forms tops and bottoms before the underlying asset. A buy or sell signal generated when the RSI moves out of an overbought/oversold area. 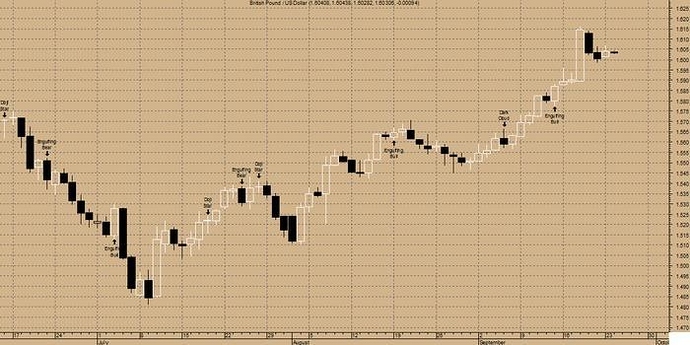 The last signal was a Sell 3 period(s) ago. SAR signal was a Buy 8 period(s) Ago. British Pound / US Dollar closed below the upper Bollinger Band by 5.4%. Bollinger Bands are 0.75% wider than normal. The current width of the Bollinger Bands (alone) does not suggest anything conclusive about the future volatility or movement of prices. MACD is BULLISH as the MACD is above the signal line. The MACD crossed above the signal line 11 period(s) ago. Since the MACD crossed the MACD moving average, British Pound / US Dollar’s price has increased 2.13%, and has been fluctuating from a high of 1.616 to a low of 1.563. The RSI is not currently in any topping (above 70) or bottoming (below 30) range but RSI just crossed below 70 from a topping formation. This is a BEARISH sign. A buy or sell signal generated when the RSI moves out of an overbought/oversold area. RSI signal was a Sell 0 period(s) ago. SAR signal was a Buy 13 period(s) Ago. British Pound / US Dollar closed below the upper Bollinger Band by 18.3%. Bollinger Bands are 49.66% wider than normal. 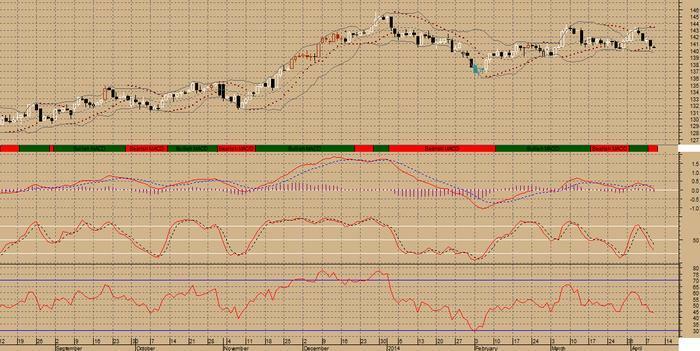 MACD is BEARISH as the MACD is below the signal line. The MACD crossed below the signal line 2 period(s) ago. Since the MACD crossed the MACD moving average, British Pound / US Dollar’s price has increased 0.47%, and has been fluctuating from a high of 1.618 to a low of 1.600. RSI signal was a Sell 3 period(s) ago. The last Directional Movement Indicators (DMI) signal was a BUY 90 period(s) ago. British Pound / US Dollar closed below the upper Bollinger Band by 40.1%. Bollinger Bands are 13.61% narrower than normal. The current width of the Bollinger Bands (alone) does not suggest anything conclusive about the future volatility or movement of prices. 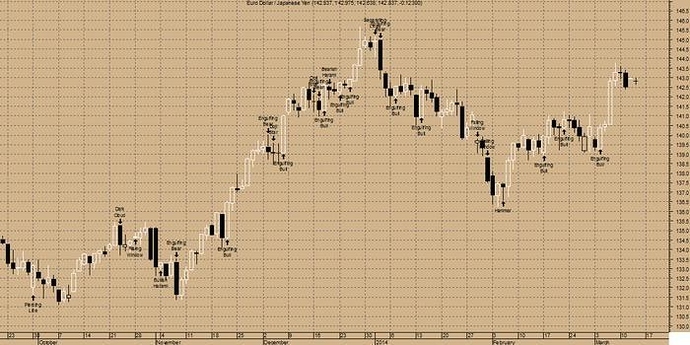 An Inside Day Narrow Range was detected by your Elliott Waves High Volatility on 08/10/13. This is usually a trade set-up opportunity. 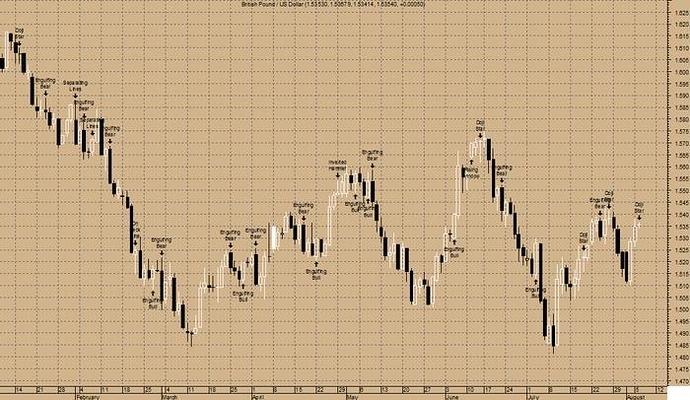 Elliott Waves High Volatility has detected a Gann Swing or Pullback that is usually a bearish pattern! It should be used with other indicators. British Pound / US Dollar is long term Bullish as the 144 days moving average of 1.56 is increasing. The Relative Strength Index is at 58.61 in the neutral territory. 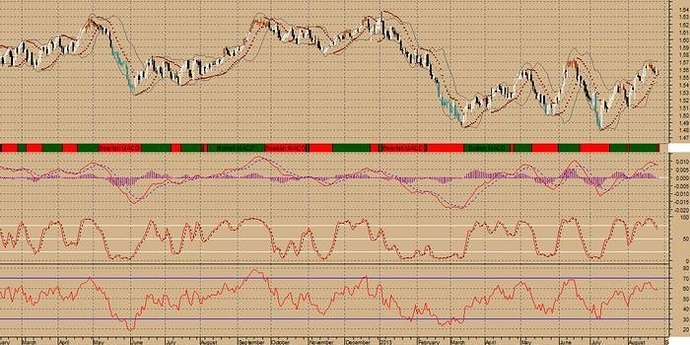 The Relative Momentum Index is at 76.73 in the overbought territory. An important indicator for Elliott waves, the Elliott oscillator is at 0.02, in positive territory; this is a bullish sign. An equally important indicator, the STORSI is at 15.29. This value is in the oversold territory. MACD is BULLISH as the MACD is above the signal line. The MACD crossed above the signal line 8 period(s) ago. Since the MACD crossed the MACD moving average, Australian Dollar / US Dollar’s price has increased 1.45%, and has been fluctuating from a high of 0.976 to a low of 0.943. RSI was a Sell 1 period(s) ago. SAR signal was a Buy 12 period(s) Ago. 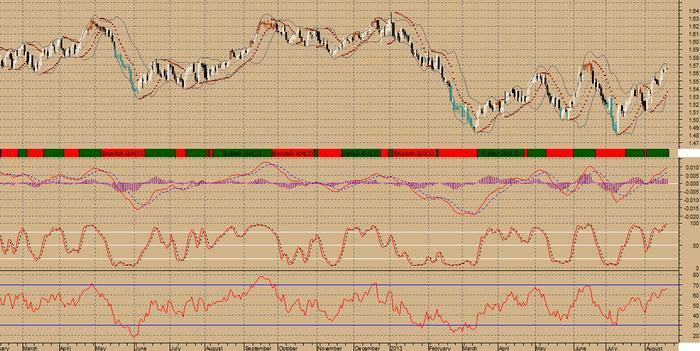 Australian Dollar / US Dollar closed below the upper Bollinger Band by 18.0%. Bollinger Bands are 15.33% wider than normal. The current width of the Bollinger Bands (alone) does not suggest anything conclusive about the future volatility or movement of prices. Australian Dollar / US Dollar is long term Bullish as the 144 days moving average of 0.95 is increasing. The Relative Strength Index is at 68.60 in the neutral territory. 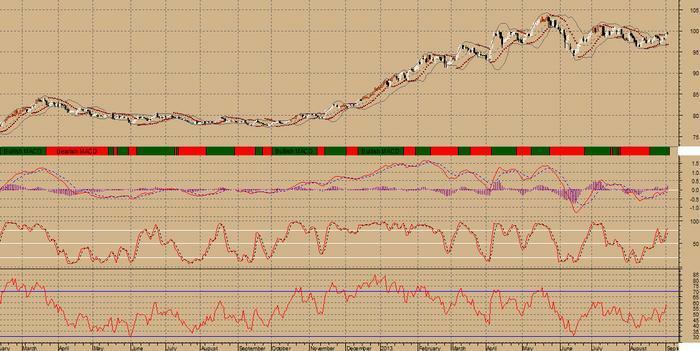 The Relative Momentum Index is at 82.44 in the overbought territory. An important indicator for Elliott waves, the Elliott oscillator is at 0.02, in positive territory; this is a bullish sign. 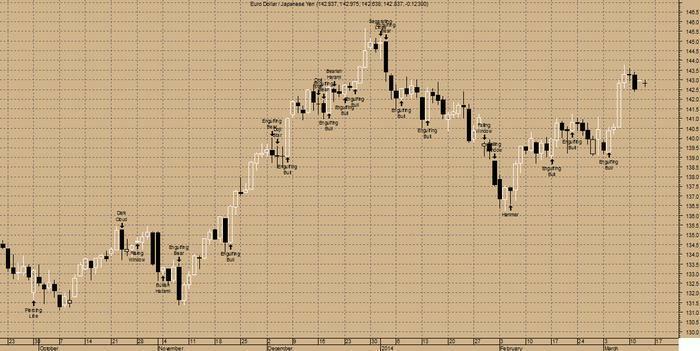 An equally important indicator, the STORSI is at 38.19. This value is in the neutral territory. A long lower shadow has formed. This is typically a bullish signal (particularly when it occurs near a low price level, at a support level, or when the security is oversold).A spinning top has formed which is a candle with a small real body. Spinning tops identify a session in which there is little price action as defined by the difference between the open and the close. 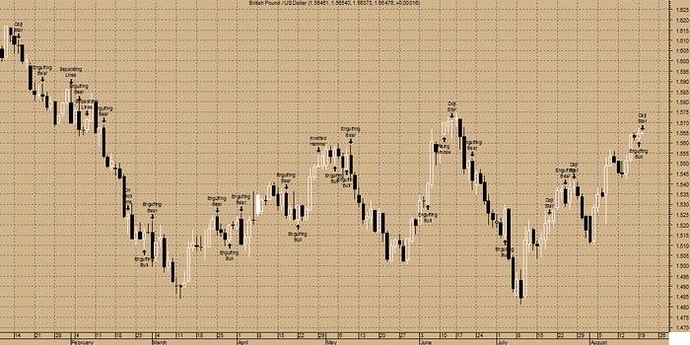 During a rally or near new highs, a spinning top can be a sign that prices are losing momentum and the bulls may be in trouble.Three black candles has formed during the last three bars. Although these candles were not big enough to create three black crows, the steady downward pattern is bearish. MACD is BEARISH as the MACD is below the signal line. The MACD crossed below the signal line 3 period(s) ago. Since the MACD crossed the MACD moving average, British Pound / US Dollar’s price has decreased 0.64%, and has been fluctuating from a high of 1.621 to a low of 1.600. Stochastic was a Buy 10 Period(s) Ago. SAR signal was a Sell 2 period(s) ago. 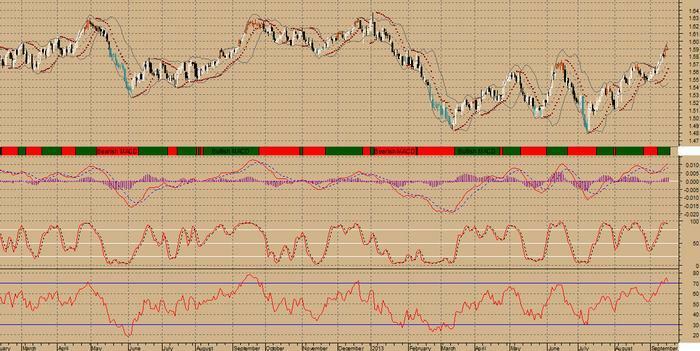 British Pound / US Dollar closed above the lower Bollinger Band by 39.6%. Bollinger Bands are 36.50% narrower than normal. The current width of the Bollinger Bands (alone) does not suggest anything conclusive about the future volatility or movement of prices. 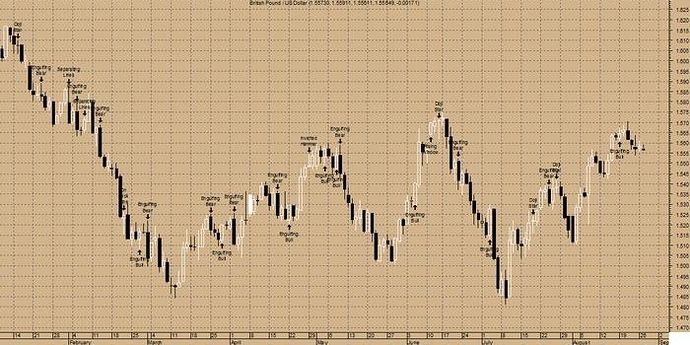 An Inside Day Narrow Range was detected by your Elliott Waves High Volatility on 31/10/13. This is usually a trade set-up opportunity. Elliott Waves High Volatility has detected an Isolated Low at 1.60 one bar ago ; this is usually a bullish sign that is not to be used alone! British Pound / US Dollar is long term Bullish as the 144 days moving average of 1.57 is increasing. The Relative Strength Index is at 49.07 in the neutral territory. The Relative Momentum Index is at 59.55 in the neutral territory. An important indicator for Elliott waves, the Elliott oscillator is at 0.01, in positive territory; this is a bullish sign. An equally important indicator, the STORSI is at 4.14. This value is in the oversold territory. MACD is BULLISH as the MACD is above the signal line. 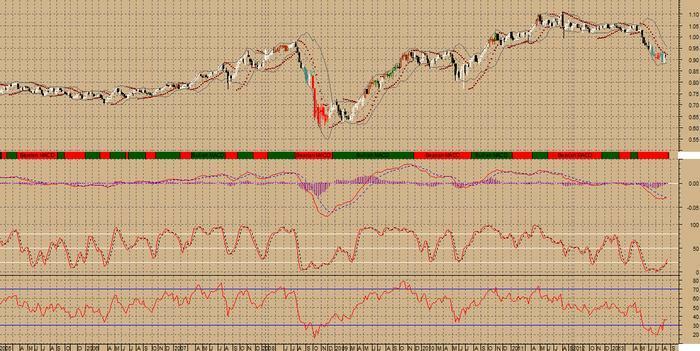 The MACD crossed above the signal line 31 period(s) ago. Since the MACD crossed the MACD moving average, US Dollar / Japanese Yen’s price has increased 4.66%, and has been fluctuating from a high of 103.389 to a low of 97.458. MACD is currently not Overbought or Oversold. 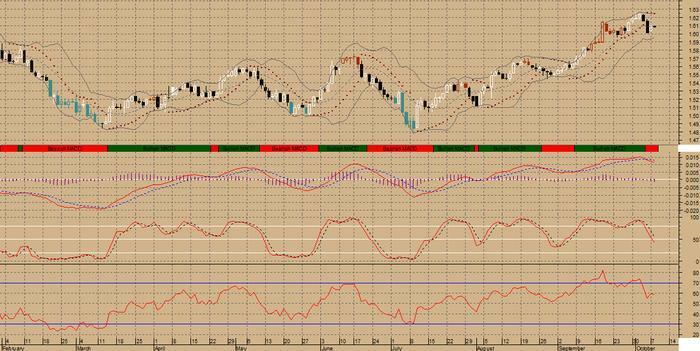 Stochastic Oscillator is currently above 80. This is an an “overbought” condition. RSI was a Sell 6 period(s) ago. SAR was a Buy 2 period(s) Ago. 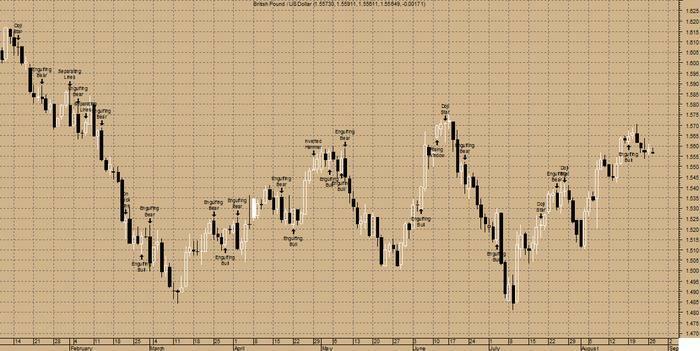 US Dollar / Japanese Yen closed below the upper Bollinger Band by 26.0%. Bollinger Bands are 14.71% narrower than normal. The current width of the Bollinger Bands (alone) does not suggest anything conclusive about the future volatility or movement of prices. Elliott Waves High Volatility has detected an Isolated Low at 102.57 one bar ago ; this is usually a bullish sign that is not to be used alone! Elliott Waves High Volatility has detected an Isolated High at 103.39 one bar ago; this is usually a bearish sign that is not to be used alone! 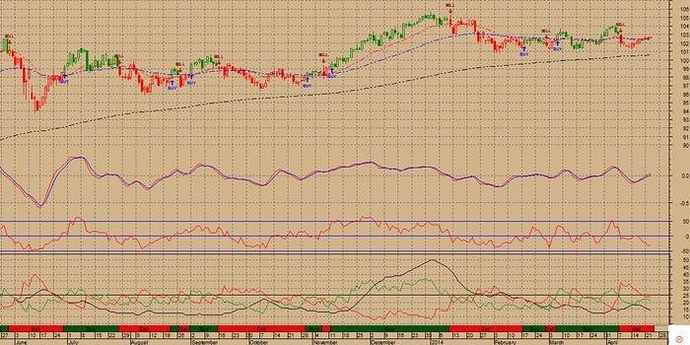 US Dollar / Japanese Yen is long term Bullish as the 144 days moving average of 98.49 is increasing. The Relative Strength Index is at 63.54 in the neutral territory. The Relative Momentum Index is at 84.71 in the overbought territory. An important indicator for Elliott waves, the Elliott oscillator is at 1.98, in positive territory; this is a bullish sign. An equally important indicator, the STORSI is at 32.94. This value is in the neutral territory. on Tuesday thanks to strong U.S. manufacturing data, but trading was subdued as most investors stayed on the sidelines ahead of the outcome of the U.S Federal Reserve’s policy meeting this week. Australian Dollar / US Dollar broke above the down trendline at 0.89, 2 days ago. This is a bullish sign. This down trendline, currently with an ending point at 0.89, now provide downside support. Prices having only risen 0.67% since the breakout. MACD is BULLISH as the MACD is above the signal line. The MACD crossed above the signal line 3 period(s) ago. Since the MACD crossed the MACD moving average, Australian Dollar / US Dollar’s price has increased 2.62%, and has been fluctuating from a high of 0.898 to a low of 0.873. Stochastic Oscillator is currently above 80. This is an indication being in an “overbought” condition. Directional Movement Indicators (DMI) and SAR signal was a BUY 3 periods ago. 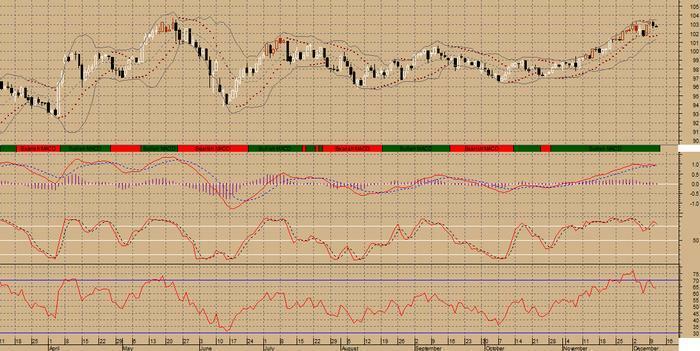 Australian Dollar / US Dollar closed below the upper Bollinger Band by 16.4%. Bollinger Bands are 11.19% narrower than normal. The current width of the Bollinger Bands (alone) does not suggest anything conclusive about the future volatility or movement of prices. 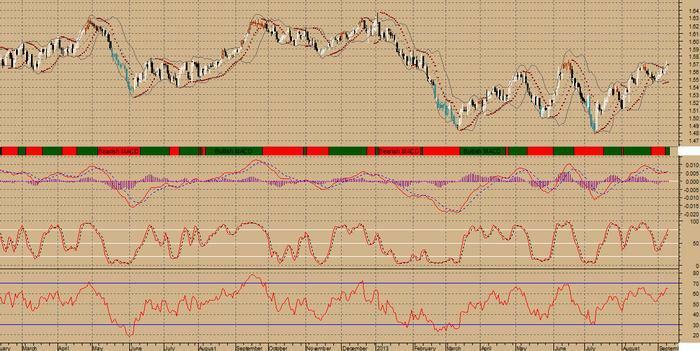 Australian Dollar / US Dollar is long term Bearish as the 144 days moving average of 0.92 is decreasing. The Relative Strength Index is at 58.15 in the neutral territory. The Relative Momentum Index is at 44.13 in the neutral territory. An important indicator for Elliott waves, the Elliott oscillator is at 0.00, in positive territory; this is a bullish sign. 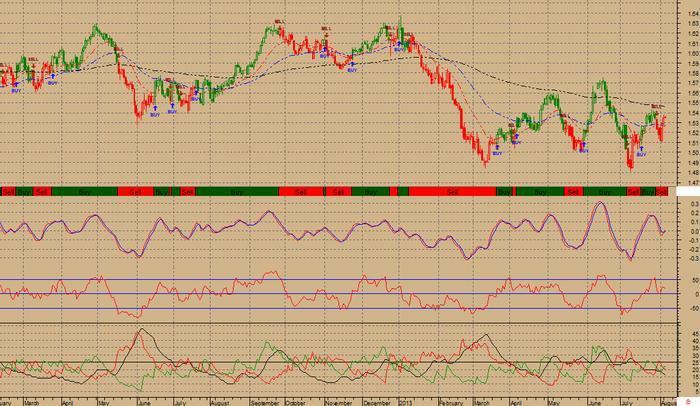 An equally important indicator, the STORSI is at 100.00. This value is in the overbought territory. [B]Overall, the bias in prices is: Sideways. The previous 10 candlestick bars, there are 7 white candles versus 2 black candles with a net of 5 white candles. 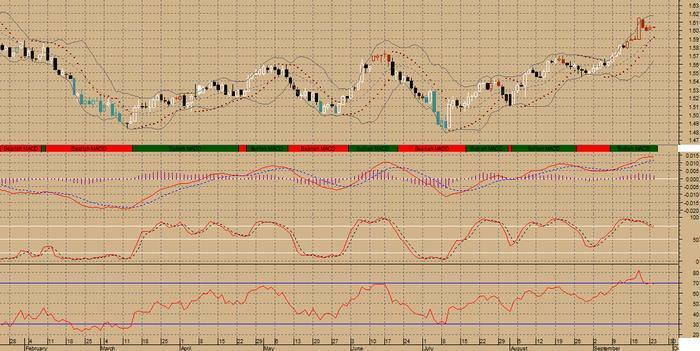 MACD is BULLISH as the MACD is above the signal line.The MACD crossed above the signal line 22 period(s) ago. Since the MACD crossed the MACD moving average, Euro Dollar / Japanese Yen’s price has increased 2.06%, and has been fluctuating from a high of 143.783 to a low of 138.671. The MACD is currently not in an Overbought/Oversold range. Directional Movement Indicators (DMI) currently is not indicating a specific price direction. SAR signal was a Buy 5 period(s) Ago. 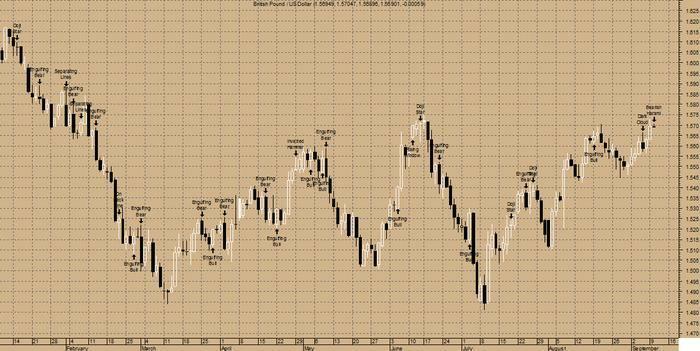 Euro Dollar / Japanese Yen closed below the upper Bollinger Band by 15.8%. Bollinger Bands are 5.34% wider than normal. The current width of the Bollinger Bands (alone) does not suggest anything conclusive about the future volatility or movement of prices. 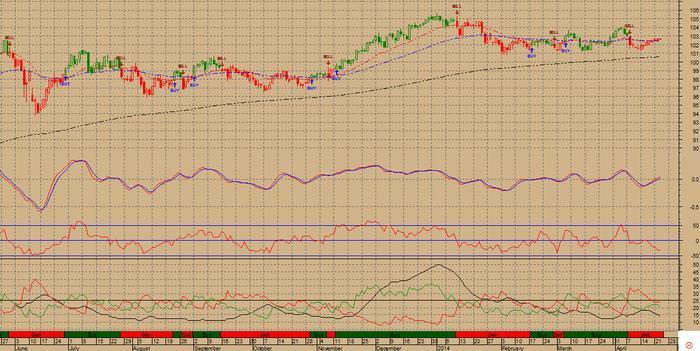 Euro Dollar / Japanese Yen is long term Bullish as the 144 days moving average of 137.47 is increasing. The Relative Strength Index is at 61.46 in the neutral territory. The Relative Momentum Index is at 71.33 in the overbought territory. 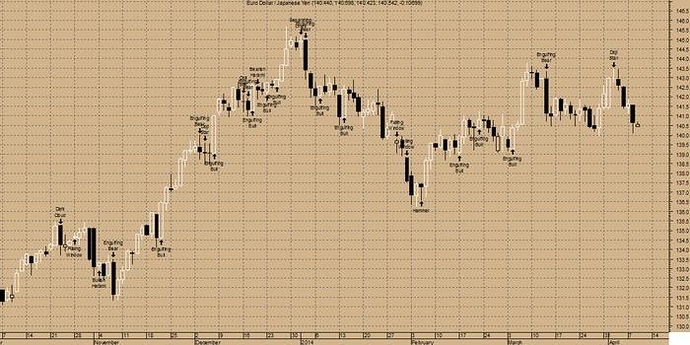 An important indicator for Elliott waves, the Elliott oscillator is at 1.86, in positive territory; this is a bullish sign. An equally important indicator, the STORSI is at 73.69. This value is in the overbought territory. Euro Dollar / Japanese Yen broke below the up trendline at 140.54 today. This is a bearish sign. This up trendline, currently with an ending point at 140.75, now provide upside resistance. The most recently confirmed down trendline for Euro Dollar / Japanese Yen has an ending point currently at 143.38. Expect prices to have some difficulty rising above this trendline. A break above this trendline (particularly on heavy trading) would be a bullish sign. 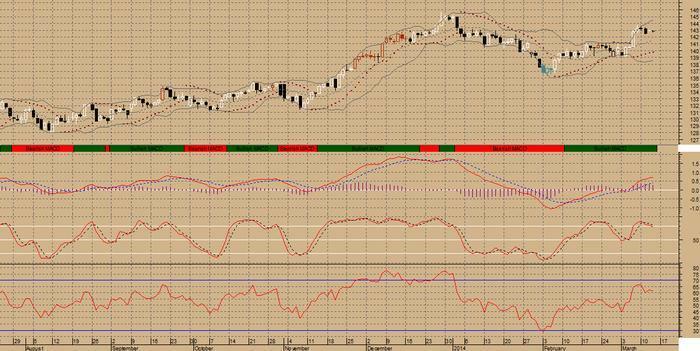 MACD is BEARISH as the MACD is below the signal line. The MACD crossed below the signal line 1 period(s) ago. Since the MACD crossed the MACD moving average, Euro Dollar / Japanese Yen’s price has decreased 0.08%, and has been fluctuating from a high of 141.591 to a low of 140.077. Stochastic signal was a Buy 7 Period(s) Ago. RSI has just reached its lowest value in the last 14 period(s). This is BEARISH signal.The RSI has set a new 14-period low while the price of Euro Dollar / Japanese Yen has not. This is a BEARISH DIVERGENCE. ADX is currently below both Plus and Minus Directional indicators and Directional Movement Indicators (DMI) currently is not indicating a specific price direction. SAR signal was a Sell 1 period(s) ago. 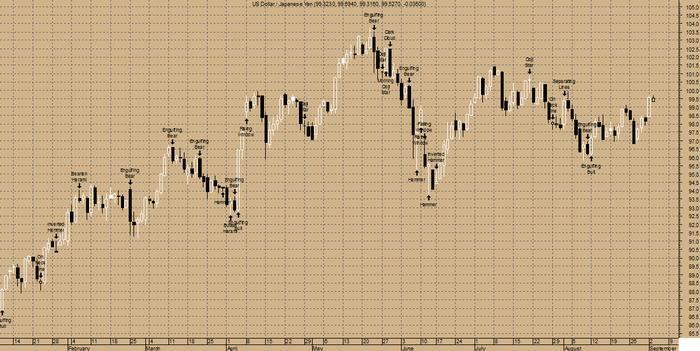 Euro Dollar / Japanese Yen closed above the lower Bollinger Band by 19.8%. Bollinger Bands are 37.51% narrower than normal. The current width of the Bollinger Bands (alone) does not suggest anything conclusive about the future volatility or movement of prices. 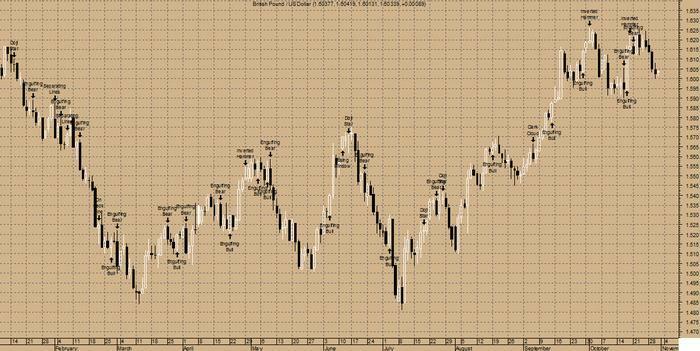 An Inside Day Narrow Range was detected by your Elliott Waves High Volatility on 09/04/14. This is usually a trade set-up opportunity. Elliott Waves High Volatility has detected an Isolated Low at 140.08 one bar ago ; this is usually a bullish sign that is not to be used alone! 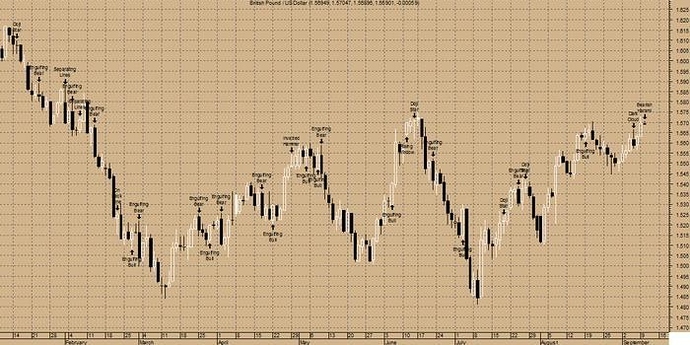 Elliott Waves High Volatility has detected a Gann Swing or Pullback that is usually a bearish pattern! It should be used with other indicators. Euro Dollar / Japanese Yen is long term Bullish as the 144 days moving average of 138.38 is increasing. The Relative Strength Index is at 44.19 in the neutral territory. 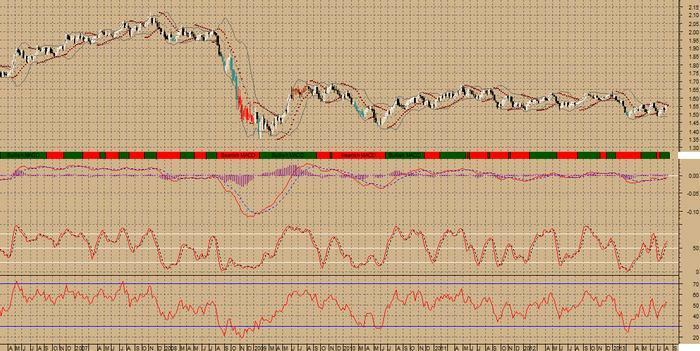 The Relative Momentum Index is at 51.20 in the neutral territory. An important indicator for Elliott waves, the Elliott oscillator is at -0.16, in negative territory; this is a bearish sign. An equally important indicator, the STORSI is at 11.68. This value is in the oversold territory. US Dollar / Japanese Yen broke below the up trendline at 101.97, eleven days ago. This is a bearish sign. This up trendline, currently with an ending point at 103.48, now provide upside resistance. Prices only declined 0.65% since the breakout. 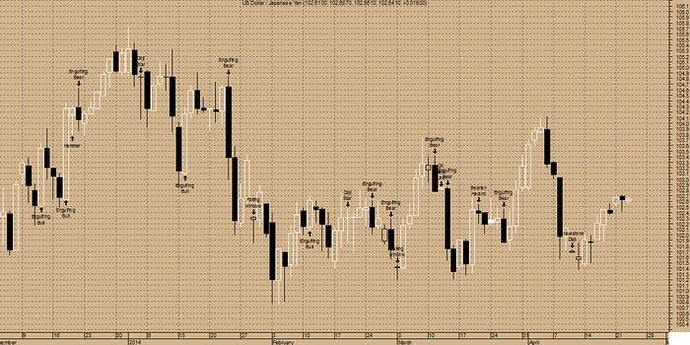 The previous 50 candlestick bars, there are 32 white candles versus 18 black candles with a net of 14 white candles. MACD is BULLISH as the MACD is above the signal line. The MACD crossed above the signal line 1 period(s) ago. Since the MACD crossed the MACD moving average, US Dollar / Japanese Yen’s price has increased 0.02%, and has been fluctuating from a high of 102.721 to a low of 102.409. MACD is not Overbought or Oversold. Stochastic signal was a Buy 5 Period(s) Ago. SAR signal was a Sell 11 period(s) ago. 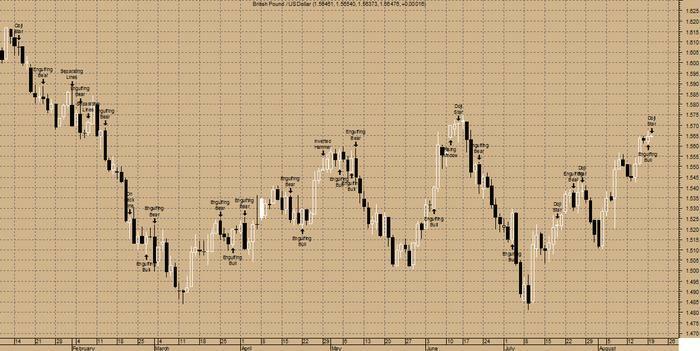 US Dollar / Japanese Yen closed below the upper Bollinger Band by 48.7%. Bollinger Bands are 14.33% narrower than normal. The current width of the Bollinger Bands (alone) does not suggest anything conclusive about the future volatility or movement of prices. 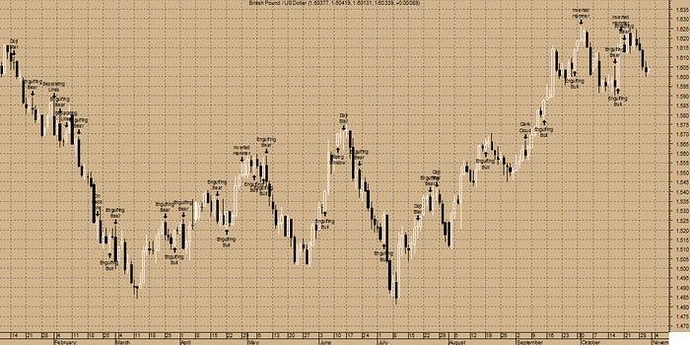 An Inside Day Narrow Range was detected by your Elliott Waves High Volatility on 23/04/14. This is usually a trade set-up opportunity. 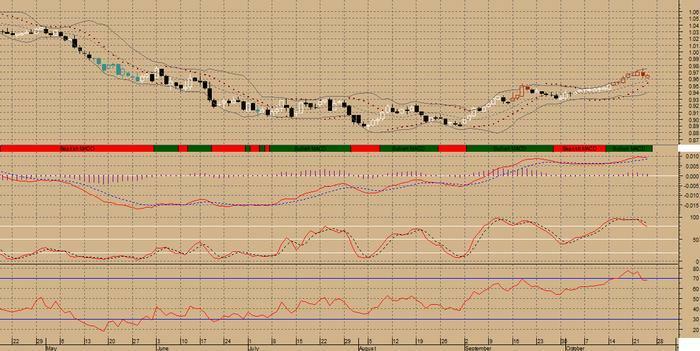 US Dollar / Japanese Yen is long term Bullish as the 144 days moving average of 101.61 is increasing. The Relative Strength Index is at 52.64 in the neutral territory. The Relative Momentum Index is at 51.50 in the neutral territory. An important indicator for Elliott waves, the Elliott oscillator is at 0.06, in positive territory; this is a bullish sign. An equally important indicator, the STORSI is at 97.06. This value is in the overbought territory. US Dollar / Japanese Yen is currently 1.7% above its 200-period moving average and is in an downward trend. Volatility is low as compared to the average volatility over the last 10 periods. Trend forecasting oscillators are currently bearish on USDJPY and have had this outlook for the last 8 periods.